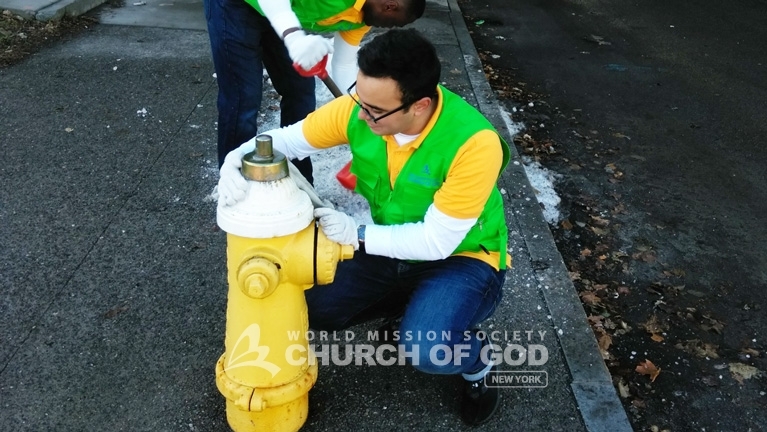 On January 28, 2018, the World Mission Society Church of God in Rochester went to the streets to raise awareness for the Adopt-a-Hydrant program. Church volunteers collaborated with the Southwest Quadrant Neighborhood Service Center and the Rochester Fire Department to jump-start the program. Adopting hydrants is an important need in Rochester as devastating events have occurred due to poor maintenance of fire hydrants. As a result, firefighters have had difficulties accessing water during emergencies. 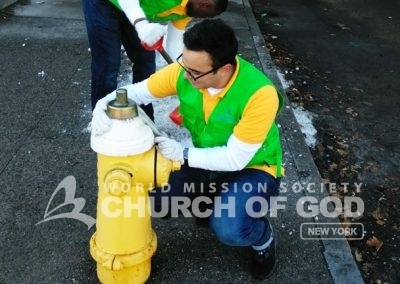 To alleviate the high volume of unclaimed hydrants, the Church of God adopted hydrants on Exchange Boulevard. About ten volunteers gathered around 9:30 a.m., ready to embrace the day with their iconic yellow t-shirts and green vests. With bright smiles they cleaned and cleared the hydrants of all snow, ice and debris. Until noon, participants shoveled snow, raked leaves, broke pieces of ice, and picked up garbage in proximity of the adopted hydrants. 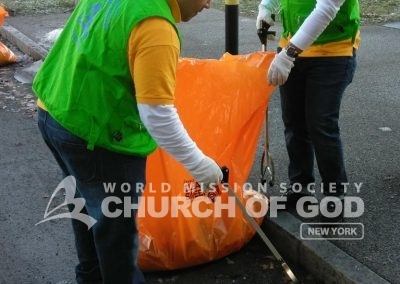 Church of God volunteers picking up litter by a nearby fire hydrant. Volunteer cleaning a hydrant in the city of Rochester during the Adopt-a-Hydrant cleanup. During the course of the event, three major news stations captured footage of the cleanup—WROC8, Spectrum News Rochester and 13WHAM. 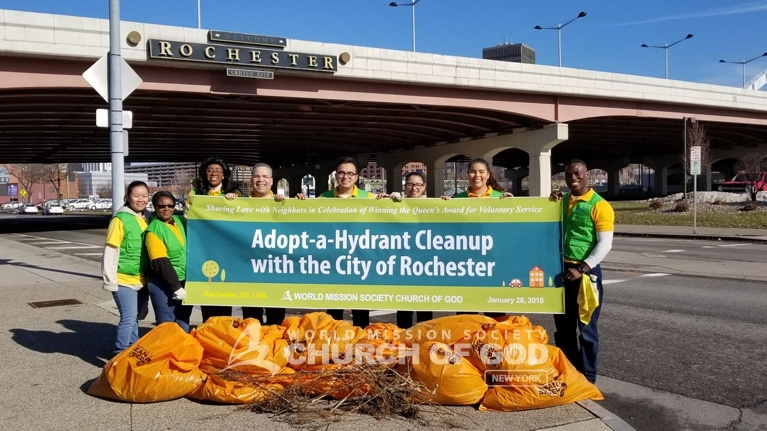 The Fire Department of Rochester acknowledged the Church of God volunteers for not just raising awareness to local residents, but also for taking initiative to adopt hydrants and clean the areas surrounding it. 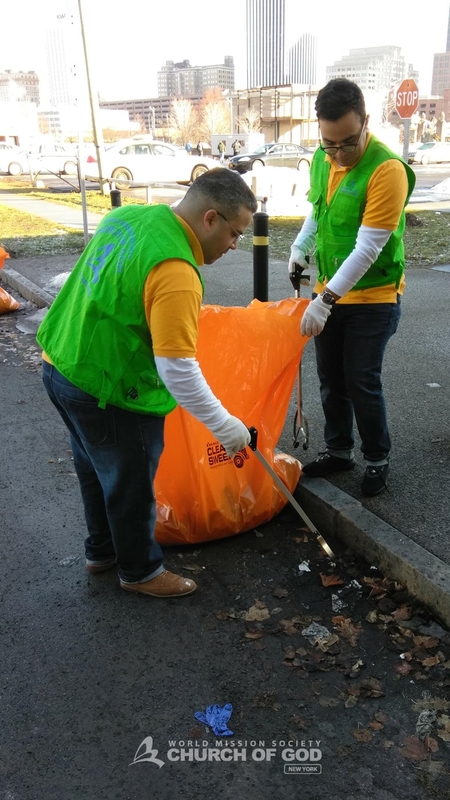 This cleanup effort was very meaningful to those living in Rochester because of its relevance to the community’s needs, in which they needed assistance on. The city continually expressed its gratitude towards the volunteers for their good deeds. Furthermore, the Church of God received special recognition from Mayor Lovely Warren, who is also the Director of Neighborhood Service Centers. 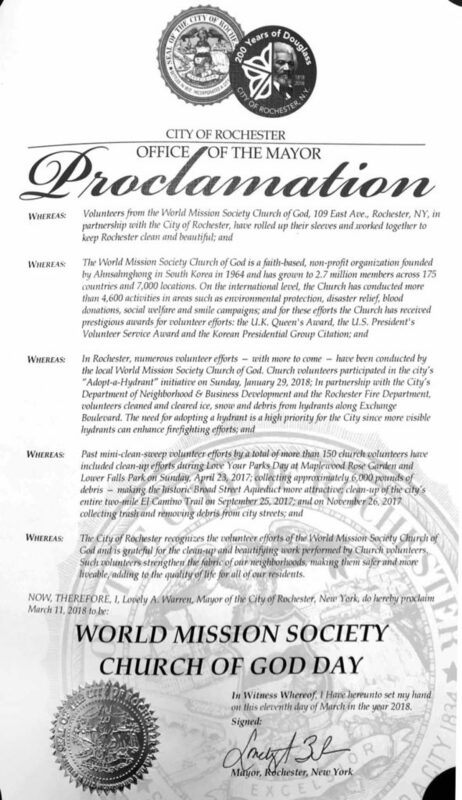 On behalf of the city of Rochester, Lovely Warren declared March 11, 2018 to be World Mission Society Church of God Day, in honor of the members’ volunteer efforts. Read about the Church of God in the local news. Wow, it’s very touching to see and hear about this kind of work. With so much negativity in the news, I feel that it’s hard to be positive sometimes. Volunter acts like the one announced in this article really lift me up! Thank you! Que Dios les bendiga mucho! !